So, there are looooooads of blog posts about tips for first time mums, so I thought why not add to the barage of advice ! But I didn't find much in the way of advice for parents with CFS. ( Chronic Fatigue Syndrome ) so here goes. If you are reading this and you don't have CFS, chances are some of them might be relevant anyway. Caring for a little wriggler is tiring for even the most energetic of bods. 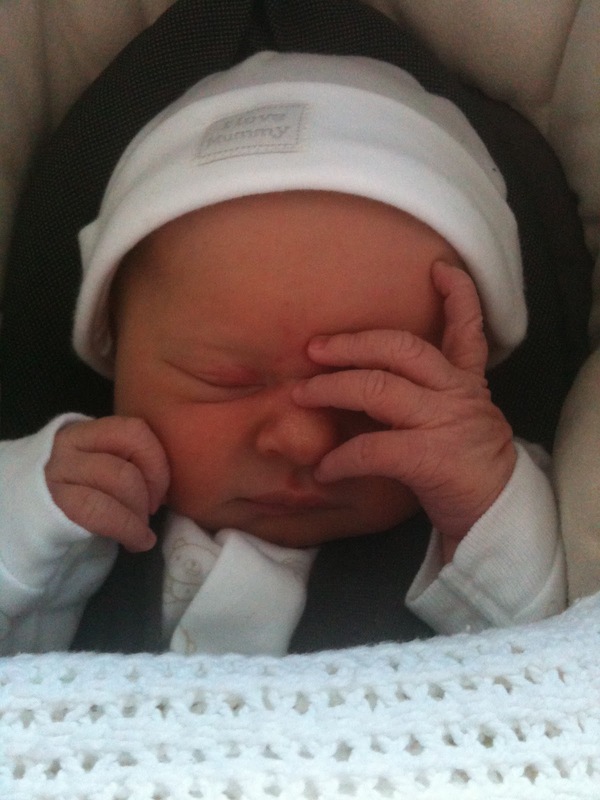 Remember that, for now, you aren't quite like other first time Mum's, and trying to be will just make you more unwell. Coming to terms with this will save you a lot of problems. BUT having a baby when you have CFS can still be hugely joyful, and rewarding, just a little different. All of this is purely from my experience, and every Mum is different, as is every CFS sufferer, so just take the ideas with a pinch of salt. I found that CFS didn't really affect me too badly during the first 3 months, as I spent most of it in bed or on the sofa with a baby feeding. It didn't go away, and I still felt unwell, but it was too debilitating. The beauty of breastfeeding is there are no bottles to wash, and If you do manage to get out the house, as long as you have a sparsely packed changing bag, you can just leave as you are. If people offer to make you meals/clean/tidy or do some shopping for you - ACCEPT THE HELP ! I found that communicating with people about this was very draining so my Husband did all the organising of these things, which meant they were a help, not more tiring. Talking to people can be as draining as going out for a walk, so beware of too many visitors/people. If you are reliant on your partner doing all the cooking, as I was, and mostly still am. Look into buying some healthy ready meals. Sainsburys and Ocado do some lovely ones, yes there are a wee bit pricey, but if you can stretch to it, it will give your OH a welcome break, and might buy you just a little bit of time sitting together. I found it a bit lonely at times, as when he was at home rather than working he had to always be doing housework or cooking, so we rarely got to sit down together. Discovering nice, healthy ready meals was a great help in the early days, and 18 months on, still is. Changing bags can be heavy. Just pack in one what you need. It is unlikely with CFS you will be going out for a full day, or to the back of beyond, so as long as you have a nappy a small pack of wipes, a change of clothes and any food required, that is all you need. If you get really stuck, shops sell things, and other parents lend things. Have changing equipment in every room you spend time in. Don't waste energy carrying baby from one room to the next just to change a nappy. I can't speak from experience, cos if I did have PND, it wasn't the conventional type and hit me a bit later than normal. The problem with PND is many of the symptoms are the same as CFS, so it can be very hard to work out what's what. I had a new GP when I had my daughter and she just thought I had PND, but when I spoke to a CFS specialist they thought I didn't it was just CFS getting worse, and my mind not coping with it. But always get help, if you are struggling to cope with the emotional affects of having CFS and it's frustrations - get referred to a councillor. You can usually get this on the NHS, and if your GP thinks you have PND, just go with it and you'll get a referral much quicker. Don't be afraid of getting into the 'mental health service'. Sadly, if you have a bit of a 'label' for a while, you will get more help. It's not as scary a place as you might think. If you don't have many offers of help and are struggling, contact a 'home care' agency. They will come in and do some daily tasks for you. Washing, tidying, shopping, food prep. I didn't have this with my first child, but when we have another one I probably will. If you are someone who doesn't cope well with mess and a dirty house, then if you can possibly afford it, get a cleaner. If you can't afford it weekly, most agencies will just pop in for a one off clean now and again to keep you a float. Some people can ignore mess and a less than shiny bathroom, if you are one of these people great, but if not, you will probably feel a little less overwhelmed if you have shiny taps once in a while ! There is this weird obsession in middle class England of getting out and sitting in rooms with babies 'doing' things. Most of these activities are really for the Mums sanity to get them out the house. If you can go to one or two, great, if you don't benefit from them yourself and you end up more exhausted, really, whilst your baby is under about 10 months they won't miss out. If you know anyone else with other babies, get them to come to your house for a short amount of time for a bit of interaction. ( less noisy in small quantities !) Other than that, your baby really won't be any less of a genius for not going ! When your little one gets a bit older and starts to crawl they might enjoy them a bit, if you can get to one, I get a taxi there, don't walk as you'll use up energy whilst there, so you might need to save it for the upping and downing involved in picking your child. If you can, find a small one, in one room, and go regularly, then you will get to know the people there and maybe explain a bit about your condition so if you need help they may offer. This feels less alienating than going to lots of bigger groups and expounding more energy than if you just go to one and get to know it and other parents there. I have to be honest this was the stage I found the most exhausting and kind of hit a brick wall. By now your baby will be roughly 6 months old. If you aren't coping and your CFS is getting worse, now might be the time to have help with some childcare if you aren't already. A friend/ relative/ childminder having your little one for a morning once or twice a week, could just be what you need. Babies are often not sleeping through by this point, but are requiring more from you in the day, milk feeds, solids, more mess, more clearing up, more awake time, it really is tough. So take what help you can get, or pay someone for it if needs be. If you would be a 'make everything from scratch' Mum then thankfully there are some brilliant products out there which are organic and not full of nasties. Gone are the days when you can only buy some powdered lamb stew - (God only knows how they make that stuff !) Ella's kitchen, Baby Plum, and Organix all do brilliant things. I weaned my little tyke almost entirely on their products. That and just giving them single ingredients of what you could spend ages making into something. Like a lump of broccoli and a bit of omelette, etc etc. some people call this 'baby led weaning' for me, it was more like 'low energy weaning' and coupled with goo from tubes and pots, we just about, made it through. Also, until babies are about 9 months, they don't necessarily need 3 'meals' per day. With milk, as well, often 2 meals and some rice cakes to nibble in between is enough. Frozen mash is great and sainsburys do it without added salt. Fish - easy to microwave and most babies love it. Just by frozen fillets, easy peasy. Frozen peas do well in the microwave if lifting heavy pans is a problem ( my daughter walks to the freezer and shouts 'PEAS' then eats them frozen, she loves them that much. Omlette - easy peasy and quick to cook so no standing at the cooker for ages. 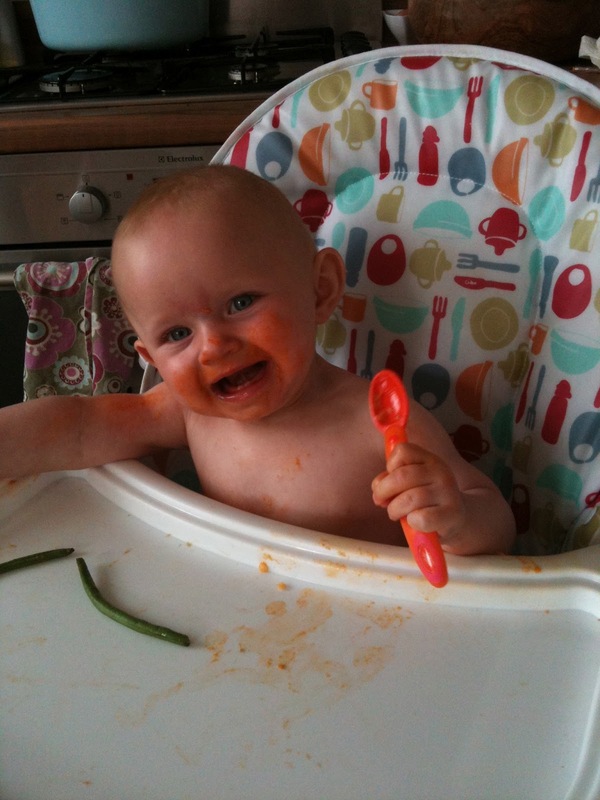 The weaning phase for me, was a total blur. Most days I felt like I had flu, the brain fog was horrendous and our house was bordering on a health hazard at times. It was tough, getting help and regular rest at this stage is essential if you are struggling. But, you might not find this - you might sail through ! When your little one is able to sit up, have a shower together, I found sitting on the floor of our shower cubicle with my little one, was a brilliant, low energy activity that she loved, got me and her clean and also got her used to water. We still do this now, it's great. Remember to sit tho - standing whilst holding a heavy lump defeats the object ! As your baby gets older and needs to start getting out and about, if you are able to get out even for an hour, plan these times when you have some childcare on the same day. My friend and mother in law have my daughter 2 afternoons a week, so if I can, I try to get out on those mornings, as I know I can rest afterwards. If you live in a city, hackney cabs are great, as you can put your pushchair straight in the back of the cab, no lifting of heavy carseats. Brilliant. Most places have ones which you can phone to collect you from your house like a usual taxi, so you don't have to walk to hail one. This really has been a total lifesaver for me, without them I wouldn't get out much at all. Even if people offer you lifts, there is still the car seat inning and outing and lifting child in and out, in and out to contend with. Remember, everyone who has a small baby would say they are teetering on the edge of exhaustion and sanity at times. So be kind to yourself. Having a long term health condition only makes a tough job tougher. Whatever you use/need - cup/spoon/bowl/ dummies/bottles etc. have lots of them. Even if their cup is in the other room, if you have lots you can just get another one out rather than walk to get it. Most parents put their children in a bouncy chair to look out the window/at toys for short periods of time while they cook/clean/ put clothes away/ get ready to go out. Doing this to enable you to lie on the sofa isn't child neglect ! As long as they aren't distressed, and they get talked to lots in between these times, in my opinion they will be fine. It just feels weird cos your not doing anything ! This took me a long time to get my head around. I still put my daughter in her cot to sleep at nap time and bed time before I know she'll go to sleep, she has learned to lie there and amuse herself for up to half an hour. Not all babies will do this, but with a bit of coaxing, most will. However well you managed having CFS before you have a baby, you will have to re adapt to a new way of life. The days where you could do something you enjoyed, but spend the next 3 days after 'paying' for it by lying in bed are kind of gone, you just have to be more careful as there are far more consequences now if you overdo it. But that is part of being a parent, responsibility, it's tough, and even more tough when you'r body doesn't work like it ought to. Remember this baby phase doesn't last that long. If you feel unwell constantly and are struggling to cope, It will pass, and although there will be other challenges as your bundle gets older, once you are getting more sleep, things will be easier.